George Toman kicks off the New Year with a neat kit for a flat car load. Here’s George with the story. I have always liked flatcars carrying heavy equipment and various loads. 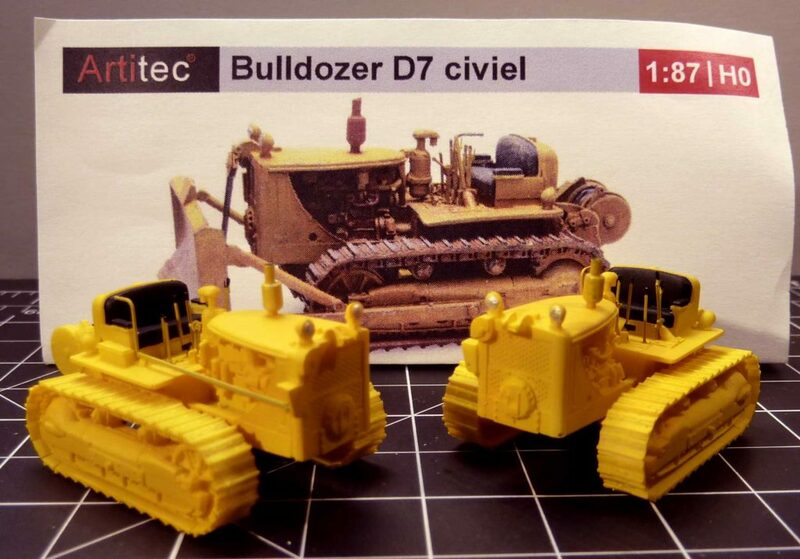 After seeing pictures of Artitec’s Caterpillar D7 Bulldozer I knew I had to add it to my roster. This is a resin model of a Cat D7 which was first manufactured in 1938 by Caterpillar Inc. I am not sure of the exact version of this model as there were variations offered such as a D7, D7C and D7D, but they were all similar in appearance with differences being in horsepower and options. Resin Car Works honcho Frank Hodina sent a workbench update. Here are his details. I had Monday off so I thought I’d finish up a couple projects for upcoming Resin Car Works releases. Then I got a little carried away decaling cars that had been sitting around. Besides all the newly decaled cars, you might notice a few projects in the upper right corner. Yup, that’s the SOO 50-foot auto box. Plus a couple of other fun projects, a C&IM coal gon and the side for a PM/C&O steel auto car. Hmmm, what will become of these? Paul Doggett sent a message recently from his home in the UK. 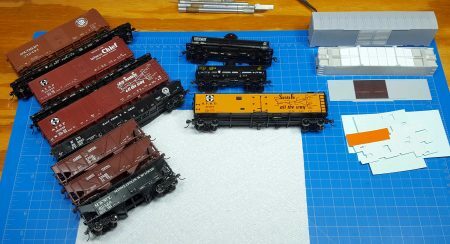 He detailed his build of the new HO scale Southern Pacific flat car kit. Here’s Paul with notes and photos. This is not an easy one to write as the Owl Mountain Models F-50-10 flat car kit is such a good kit to build. The model parts came together easily and assembly took about four to five hours. Southern Pacific 43745 is an F-50-9 class flat car, an ex-Pacific Electric car absorbed into the SP in 1928. Jason Hill of Owl Mountain Models contacted the Resin Car Works folks recently with new kit information! Owl Mountain will introduce a pair of HO scale, plastic injection molded flat car kits for Southern Pacific prototypes. These kits should be released very soon. Several of the prototype car classes came into service in the Teens and were used though to the end of the steam era, with many serving additional years in maintenance of way duty.